Before modern refrigeration techniques were developed, another equally effective method was used to keep things cool. Men went out onto the frozen rivers and cut huge blocks of ice, which were then stored in icehouses until spring. It was dangerous work, often performed in extreme conditions. If a cutter misjudged the ice, it could crack in the wrong spot. Since few people at the time knew how to swim, anyone who fell into the icy waters was unlikely to get out alive. Using large tongs and saws, the ice cutters formed their blocks on the banks of Île Jésus. The blocks of ice were sold to residents when the weather was warm so they could keep their food cool. Between 1850 and 1940, the ice business became organized. In the beginning, a few small businesses or individuals were involved. Gradually, the sector became more mechanized. 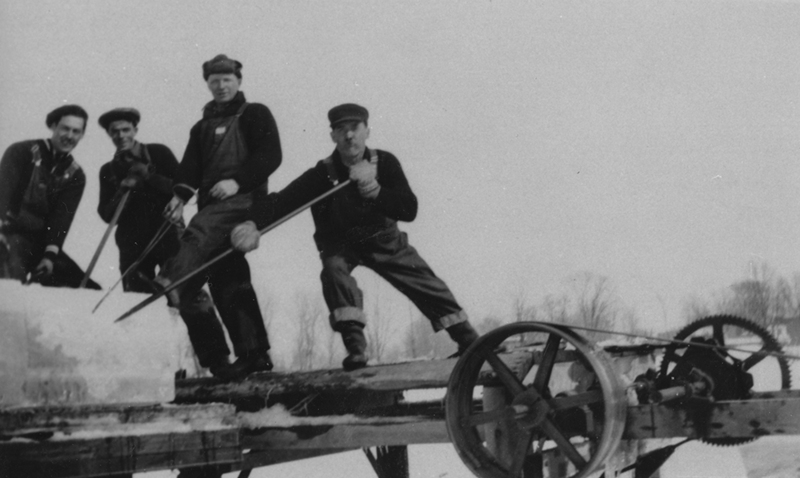 The ice industry prospered in the 1920s. It boomed and employed several hundred seasonal workers. In Sainte-Rose in the early 20th century, there were three companies owned by three different families who shared the business: Léon Cloutier’s business, Les Glacières Sainte-Rose and Les Glacières Groulx. After the refrigerator was invented and became available for sale, the ice cutter’s job disappeared.